Today's giveaway is a book! 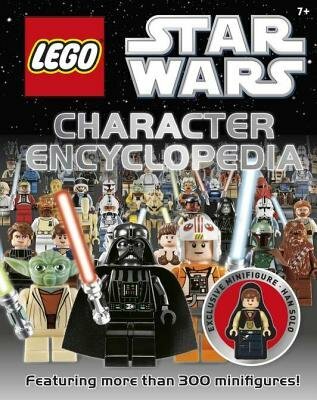 The LEGO Star Wars Character Encyclopedia featuring Ceremonial Han Solo minifigure. I didn't realize this until I looked up the cover image on Amazon but this book seems to be out of print. So if you didn't get one before, you might win a copy from me. Send an email to [email protected] with the subject line Book'em, Dano. Standard giveaway rules apply. You have until 11:59pm Pacific time December 9, 2015 to enter. Good luck! Congratulations, Jeff! Thanks for being a reader! Hello, Bothan spies! This giveaway is a special one! It is special because it's sponsored by The LEGO Group! 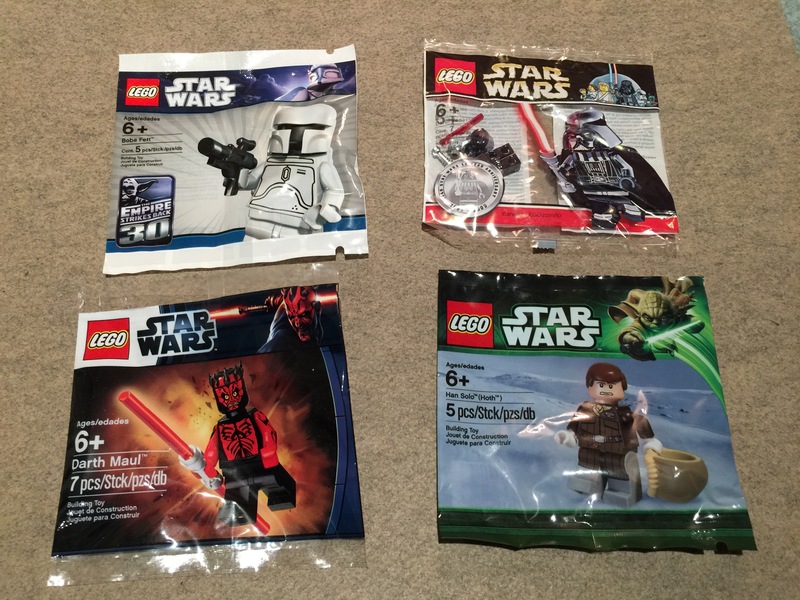 They have generously donated a copy of 75092 Naboo Starfighter for today's giveaway. How awesome is that? 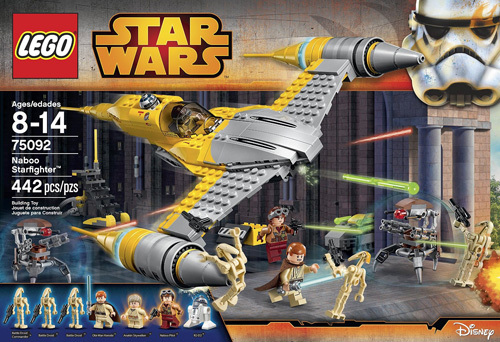 To enter, send me an email at [email protected] with Thanks, LEGO! as the subject line. Standard giveaway rules apply, except this time this contest is only open to residents of the U.S. Sorry, International folks. This item will be mailed directly from LEGO headquarters. You have until 11:59pm Pacific Time December 10, 2015 to enter. Good luck! Congratulations, Dustin! Thanks for being a reader! We're reaching the end of our 12 Days of Christmas giveaway celebration. This is Day 11, the penultimate day. 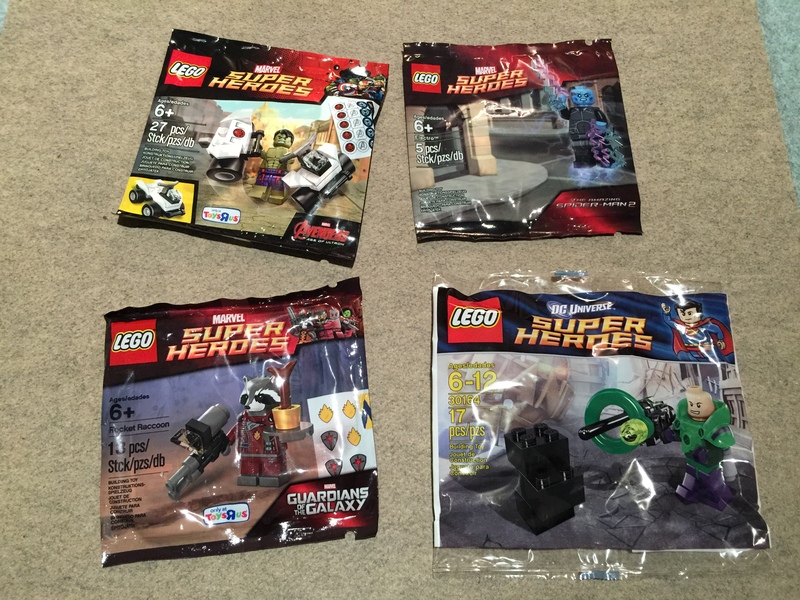 I'm going to try and go out with a bang, so for today's giveaway one lucky winner will get the above pictured LEGO Super Heroes Minifig 4-Pack: Rocket Raccoon, The Hulk, Electro, and Lex Luthor. To enter, send me an email at [email protected] with the subject line Super Duper. Standard giveaway rules apply. You have until 11:59pm December 11, 2015 to enter. The giveaway is once again open to everyone regardless of location (yesterday's was the only exception). Good luck! Congratulations, Daniel! I've sent your mailing address to my contact at LEGO. Thanks for being a reader! And once again, big thanks to LEGO for sponsoring yesterday's giveaway! This is the final day of our giveaway celebration and I went digging around my box fort for some goodies. And this is what I came up with: White Boba Fett, Chrome Darth Vader, Shirtless Horned Darth Maul, and Hoth Han. Only one winner will be lucky enough to get the above prize package. To enter this giveaway, send me an email at [email protected] with the subject line Star Wars For Life. Standard giveaway rules apply. You have until 11:59pm December 12, 2015 to enter. Good luck! Congratulations, Shae! Thanks for being a reader! Wow, I can't believe I won! Thanks a lot for these generous giveaways. I'm not as familiar with DC as Star Wars, but I quite like the Rocket Raccoon and Hulk polybags. The winning email has been randomly chosen from the eligible entries for our Day 12 Giveaway of the Star Wars Minifig 4-pack. We've had a record number of entries, but sadly we've also had a record number of disqualifications. Again, I implore you to read the rules so you're familiar with what to do for out next giveaway. Congratulations, Sean! Thanks to you and everyone else for being a reader and participating in our 12 Days of Christmas giveaway! Just wanted to say thanks for running the contest ... much appreciated. Is there a way to verify that I've been correctly entering the contests? phoenixhawk wrote: Is there a way to verify that I've been correctly entering the contests? it's pretty simple. Did you put the correct subject line outlined in the giveaway announcement? And did you include your mailing address? If you answered yes to both of those questions, you've entered correctly. I try and make these as simple as possible. Great contest! I'm very happy I was able to win one as well! Thanks, FBTB! Missed this, but would like to know when I'm getting my FBTB t shirt I ordered like six months ago.......just saying.